Many financial institutions promote Home Equity loans in the Spring. The typical approach is to highlight home remodeling, travel or credit card consolidation. 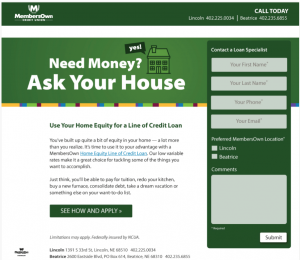 KidGlov created an empowering imaginative concept for MembersOwn Credit Union that told consumers, “If you need money, ask your house.” This powerful messaging was combined with simple, colorful graphics and digital marketing best practices that exceeded goals for impressions, engagement and conversions. Most importantly, the campaign helped the credit union increase Home Equity loan balances by 23%, nearly five times the goal of 5% set at the outset of the campaign.